Leading telecoms expert Tony Hayes dialled up success at a national business awards. Bury businessman Tony scooped the prestigious 2017 BforB Franchisee of the Year award at the referral marketing company’s annual celebration. Alongside running telecommunications group Diamond Solutions UK, Tony runs BforB groups covering the outer ring of the greater Manchester area, from Bolton to Cheadle. 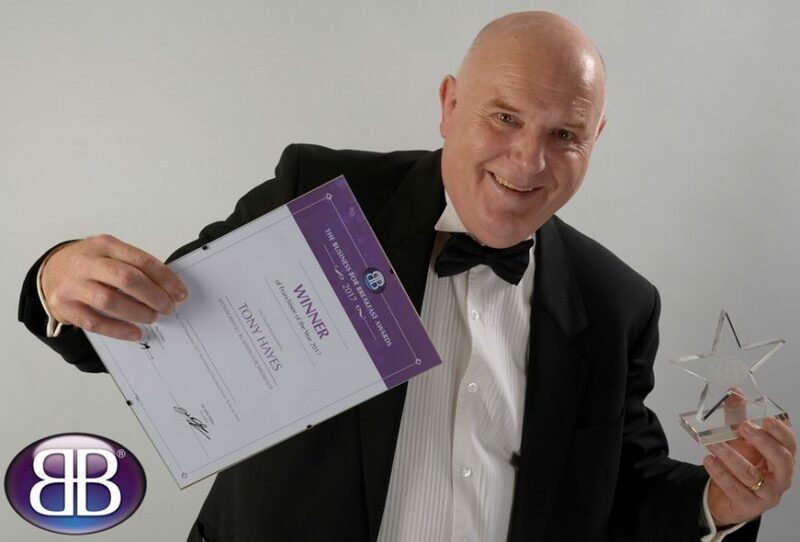 He was recognised at the national BforB Awards for the success of the groups in his franchise area, taking into account key criteria including high net worth turnover, membership growth and retention, excellent customer service and member satisfaction. Tony’s BforB groups gained much recognition at the BforB Awards. The Cheadle House Hotel, Cheadle, Cheshire, won the BforB Venue of the Year prize, Rachael Franklin, of the Georgian House, Bolton group won recognition as BforB Host of the Year, Chris Dawes, of the Bolton group, won New Member of the Year and the Bolton Wednesday Group were runner-up in the BforB Executive Team of the Year category. This year’s BforB Awards were held at the Moat House, Stoke-on-Trent, a regular BforB venue. As franchisee of the year, Tony will get to choose the venue for the 2018 awards. BforB was founded by Manchester entrepreneurs Mel and John Fisher in 2001 and has grown to host referral marketing groups across the UK and as far afield as Australia. With an estimated 60-plus per cent of the world’s business passed via referrals and leads, BforB works to grow business on a know, like and trust basis. Members get to know each other through fortnightly meetings and business friendships are formed. Members become advocates for each others’ businesses and as trust grows then more and more business is passed.